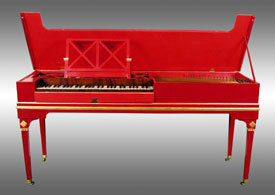 For many years we have undertaken the restoration of antique keyboard instruments. We give advice on their purchase and also act on behalf of clients in the acquisition of such musical instruments on a commission basis. After a successful purchase, we undertake the restoration of the instrument. Below are examples of our restoration work. The pictures were taken before, during and after restoration. 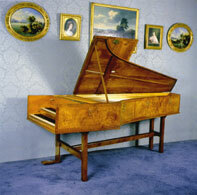 The 1766 Backers harpsichord before restoration. 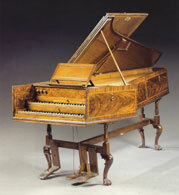 Note the later ugly piano legs, circa 1830. (Courtesy of Sotheby's). Danish Clavichord by Marcus Gabriel Sondermann, Rendsburg, 1805 before restoration, showing the modern decoration of the case exterior. (Courtesy of Sotheby's). Inscription on the soundboard of the Sondermann clavichord. Plan view of the structure of the Sondermann clavichord during restoration. 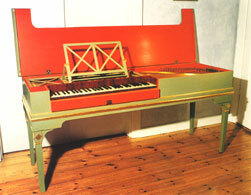 The Sondermann clavichord after restoration, with its decoration restored to its original colour scheme. 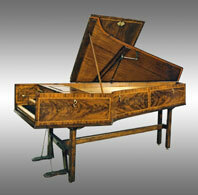 The harpsichord by Jacob Kirckman, London, 1768, before restoration. Note that the original straight supports of the stand have been replaced by modern cabrioles. (Courtesy of Sotheby's). Structure of the 1768 Kirckman harpsichord after restoration, showing the soundboard repairs and all the bracings installed. Structure of the 1768 Kirckman harpsichord during restoration, with the soundboard, bottom and some bracings removed. 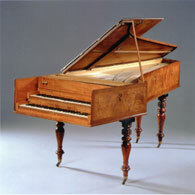 The harpsichord by Jacob Kirckman, London 1768, after restoration. Note that the discovery of the original straight supports of the stand have enabled the instrument to be restored to its original appearance. Note also that the later third pedal (for the buff stop) has been removed.